A bundle of three basic math programs, appropriate for anyone, regardless of age, who needs help learning basic math. Students learn in four critical areas, addition and subtraction, multiplication, and division. Programs feature assessment and instructional modes. Assessments determine student deficits, evaluate their progress, and help you write IEPs. 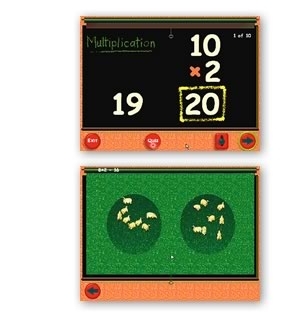 The instructional module helps students visualize math problems. Here is how it works. The computer generates random questions. Users can select answers on the keyboard, or by clicking on a number . 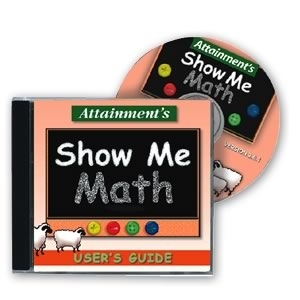 . . or the student can choose the "Show Me!" option. Here, the answer is illustrated with a short animated movie. For example, 7 ants join 6 ants, making 13. Show Me Math is IntelliKeys and TouchWindow compatible. It's appropriate for anyone, regardless of age, who needs help learning basic math.